On his ninth birthday a boy receives many presents. Two of them first seem to be less important: an old cupboard from his brother and a little Indian figure made of plastic from his best friend. But these two presents turn out to be much more magic than the rest. Based on a children’s novel by Lynne Reid Banks, 1995’s The Indian in the Cupboard introduces us to young Omri (Hal Scardino). On his ninth birthday, he receives a mix of presents he likes and a couple that seem less than stimulating: an old cupboard and a small plastic Indian. Omri soon discovers that these gifts offer real magic. When he puts the Indian in the cupboard, it comes to life. Named Little Bear (Litefoot), Omri bonds with his tiny new friend. We follow their unusual relationship as well as additional developments. Cupboard falls into the category of “movies I know I saw but don’t really remember”. However, I do recall the reaction my father had to the film, as he really enjoyed it. As for me, I guess I thought it was okay, but it clearly didn’t make much of an impression on me. 20 years later, I can’t say that I view Cupboard any differently. Indeed, the decades may have left me even less enchanted with the film, as I think it offers forgettable fantasy without much purpose of its own. Cupboard comes with a serious ET the Extra-Terrestrial vibe, which might not be a surprise given that Melissa Mathison wrote both scripts. As was also the case with Mathison’s Black Stallion, ET and Cupboard focus on pre-teen boys who grow up via their relationships with unusual figures. In the cases of ET and Stallion, the protagonists needed substitutes for absent fathers, but that’s not the case in Cupboard - and that creates an odd dynamic. Stallion’s Alec loses his father in a shipwreck, while ET’s Elliott gets stuck with a dad who abandons the family to cavort with a new young girlfriend. Whereas those characters needed to fill emotional spaces, that doesn’t appear to be the case with Cupboard’s Omri. As depicted here, he seems to be a resolutely normal kid who enjoys a resolutely normal life, complete with resolutely intact, loving, supportive family. Because of this, Omri’s emotional journey doesn’t make a ton of sense. In those other Mathison films, the protagonists needed to grow and become more secure, whereas I don’t see that for Omri. He’s a perfectly normal kid with no obvious emotional deficits – why does he need Little Bear to help him “mature”? Why can’t he stay the average, good kid he is? He’s nine, for God’s sake – why does he need to “grow up” at all? I don’t know, and the fact Omri doesn’t “need” Little Bear in the same way Elliott needed ET and Alec needed Black makes Cupboard an odd concoction. We’re asked to go on an unnecessary, perplexing emotional journey, and I don’t buy into it. Even if I got the purpose of Omri’s trek, I’d still find Cupboard to lack much real heart. The film really does come across as ersatz ET, as director Frank Oz appears to do his darnedest to channel his inner Spielberg. Heck, both films even end with sweeping music and long close-ups of their newly mature protagonists. The difference is that Oz can’t create something with the same magic that came naturally to Spielberg. Cupboard works overtime to enchant us but it falls far short of its goals and feels like it tries too hard. It wants us to embrace its wonder and fantasy but it all feels contrived and forced. Oz suppresses his natural sense of humor too much as well. Oz’s best movies have come with a playful spirit almost wholly absent from Cupboard. Sure, the movie attempts comedy, usually via the grating cowboy character Boone (David Keith), but also with more moments cribbed straight from ET. These segments lack vitality and come across like awkward attempts at merriment. One other problem I experienced came from my inability to buy into Little Bear’s reality. The Black Stallion and ET were living, breathing entities, which Little Bear is just a piece of plastic. Sure, the film attempts to give him a backstory, but who cares? None of it exists in reality, so why should I care more about Little Bear than I do the other figures Omri briefly brings to life? I don’t. I’m pretty good at suspending disbelief, but I just never found a reason to buy into Little Bear’s narrative. We’re intended to feel for him as though he’s a living entity, but at heart, we know he’s not – even in the movie’s universe, there’s no reason to view him as anything more than a delusional toy. That robs the movie of most – if not all – of its emotional tension. 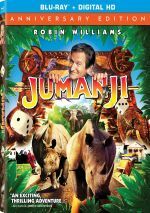 Played in a more comedic and less self-serious manner, perhaps The Indian in the Cupboard would’ve worked better for me. Or maybe I’d have liked it more if it came from a director with a better ability to create a real sense of magic and enchantment. As it stands, Cupboard provides an oddly muddled, spiritless fantasy. 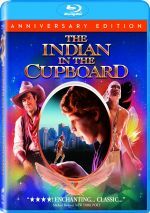 The Indian in the Cupboard appears in an aspect ratio of approximately 1.85:1 on this Blu-ray Disc. The movie looked better than expected. That was especially true due to all the effects-based composite shots needed to meld characters of different sizes. I feared those moments would look spotty, but they seemed pretty well-defined and clear. I saw some inevitable degradation in picture quality but not to the degree I feared. Overall sharpness looked fine. Even interiors sported relatively good delineation, and exteriors could be sensational. No issues with shimmering or jaggies materialized, and I saw no edge haloes. Print flaws failed to mar the presentation. Cupboard opted for a subdued but mostly natural palette. The colors offered good vivacity and seemed well-rendered. Blacks were mostly deep and rich, and low-light shots displayed nice clarity. This image satisfied. I thought the film’s DTS-HD MA 5.1 soundtrack appeared decent but not special. For the most part, the movie featured a fairly restricted soundfield. Music offered nice stereo imaging, and we got some directional speech, though the latter elements could be dodgy; the lines occasionally bled to the side when they should’ve stayed in the center. Effects involvement remained somewhat limited through most of the film. Matters perked to life at times, such as during a few action scenes or in a thunderstorm. Otherwise, the track tended toward general ambience without much impact. Audio quality came across reasonably well. Speech sometimes sounded a bit flat and dull, but the lines mostly seemed natural enough. Music offered nice range and vivacity, while effects came across as accurate and full, without obvious distortion. Though the soundtrack remained acceptable, it lacked a lot of spark. When we shift to extras, we start with an audio commentary from director Frank Oz. He offers a running, screen-specific chat about what drew him to the project, sets and locations, story/character areas, cast and performances, visual effects, music and cinematography, and related topics. Oz’s prior commentaries have been fairly average, and this one follows that trend. Oz does give us a decent look at the film, but too often, he just narrates the action, and he starts to repeat himself after a while, mainly in terms of effects. You’ll learn something from this discussion, but it doesn’t offer a particularly involving ride. Next we find Little Bear: A Return to The Indian in the Cupboard. It occupies 13 minutes, nine seconds and includes comments from actor Litefoot. He discusses how he got his role as well as various experiences during the production. Litefoot gives us a nice look at his time on Cupboard. We also get an archival making-of featurette. It goes for three minutes, 19 seconds and provides remarks from Oz, Litefoot, producer Jane Startz, screenwriter Melissa Mathison, technical advisor Jeanne Shenandoah, costume designer Deborah Scott, and actor Hal Scardino, Rishi Bhat, and David Keith. We get a basic story/character overview. A couple of minor insights emerge but this remains a promo piece. As a tie-in with the 2015 film, we get The Cast of Goosebumps Reflects on The Indian in the Cupboard. It goes for five minutes, 18 seconds and offers comments from actors Dylan Minnette and Ryan Lee. They tell us what they like about Cupboard and why it remains popular. This exists to promote Goosebumps - which becomes more obvious because Lee and Minnette talk for less than two minutes before we get a preview for Goosebumps. That promo also stands on its own (3:01). Finally, the disc finishes with two trailers for Cupboard. Though I think The Indian in the Cupboard occasionally offers some charm, it seems too derivative to succeed. It lacks much real drama and tries too hard to enchant us. The Blu-ray provides very good picture as well as mostly positive audio and a few supplements. I want to like Cupboard but it seems too much like warmed-over ET to me.